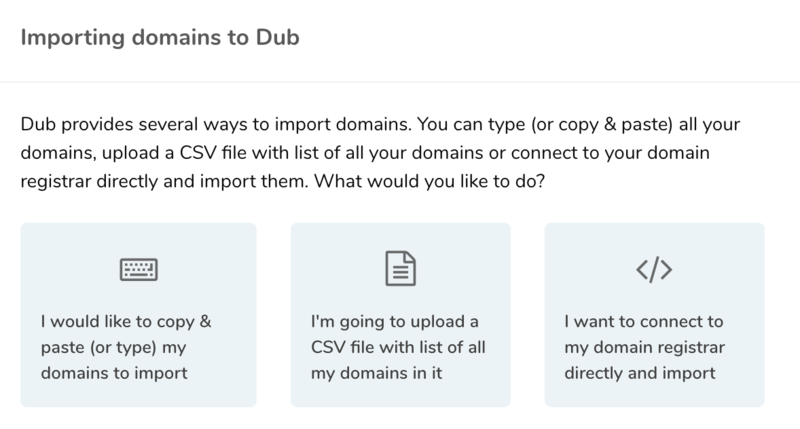 Now that you have created your Dub account and your account has been confirmed, it's time to start adding domains that you want to manage through Dub's Domain Manager, which can be accessed by clicking on "My Domains" on the left hand side menu. If you're just getting started, you will most likely see no domains listed. So click on "Add/Import Domains" button on the right hand side and you will see the dialogue as shown in screenshot 2 below. As shown in the dialogue, there are three options to add domains. Let's now go through these options one by one.